We always get our durian supply from Chong Pang Market, the stalls there have durians in different size and price. A few days ago, we bought 10 medium size durian for just for $20 meaning each is only for $2. 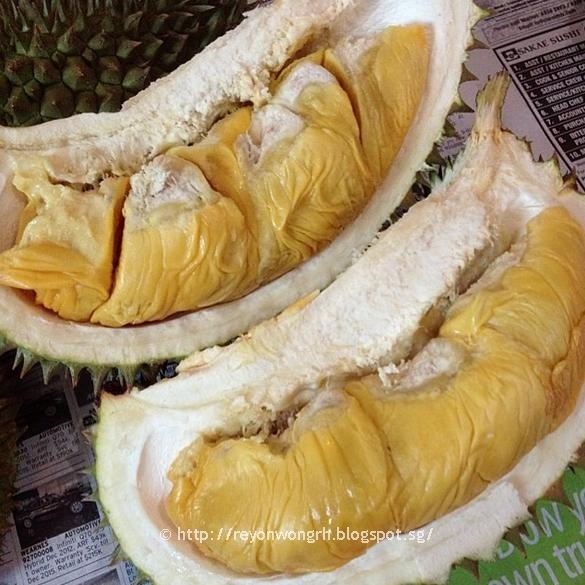 Other than different size, there is also different colour for the durian flesh such as dark yellow which is the best (mao shan wang grade), light yellow, white and pale white. Durians are delicious! If you are a tourist from overseas who comes to Singapore, you must try at least once for the taste. Close up view of the durian. Above are the 3 for $10 durians which are bigger in size and if you are lucky you might get the dark yellow flesh in it. Beside it is the $2 grade durian that is very cheap and good, so do come to Chong Pang Market (near block 101) for cheap and good durians especially on Friday and Saturday afternoon when the durian trucks bring in new stock. How we feast on durian. Above is an video clip from my Instagram showing how we open the durian and feast it.